New school construction at Mountain Valley is progressing at an amazing pace, leaving students buzzing with excitement about the future. Looks of awe and wonder abound during student tours, and the kids can hardly wait for their new PreK-12 school to open in October 2019. Mountain Valley first grade students tour their future school. I recently had the privilege of going on a construction site tour with the second and third graders. As I watched them marvel and dream about their future in the new school, I was struck with emotion and felt honored to be a part of the next chapter of Mountain Valley history. The Mountain Valley School District community, who supported the new school and made all of this possible, should feel proud of this state-of-the-art learning facility and the difference it will make in the lives of our students. It truly takes a village to raise a child, and I am thankful to live in such a caring and supportive community. Mountain Valley second and third graders get all geared up for safety and head out on a construction site tour. The new school construction project began with asbestos abatement and demolition of the old cafeteria and woodshop, followed by the recycling of the old bus barn, which was auctioned. Substantial dirt work was required to adequately separate the new building from the high water table in Saguache, as well as create a proper grade for site drainage. Footer preparation, underground plumbing and electrical, concrete slab, and structural steel framework quickly followed. The structural concrete masonry unit (CMU) block for the main and auxiliary gymnasiums was completed by our masons, which was followed by the placing of steel roof joists by a giant crane. FCI construction superintendent Troy Sergesketter leads student tours. Current work on the first floor of the academic wing includes wall backing/blocking, exterior rigid and foam insulation, exterior liquid armor/flashings, exterior CMU veneer, as well as the hanging and finishing of drywall. The second floor of the academic wing is quickly transforming as roof carpentry, EPDM roofing/flashings, overhead electrical, overhead mechanical, overhead plumbing, interior steel stud framing, and wall backing/blocking work progresses. View from the first-floor academic wing corridor. Progress is also evident in the athletic wing, which consists of the main gym, auxiliary gym, stage, locker rooms, cafeteria, kitchen, culinary arts, woodshop, and metal shop areas. The work currently in progress includes roof joists/decking, liquid armor/flashings, rigid insulation, exterior steel stud framing, roof carpentry, EPDM roofing/flashings, and CMU veneer wainscotting. Wood ceiling finishes at the main entrance of the school. After a cold and snowy winter, I am happy to announce that the Mountain Valley new school construction project is on schedule with an anticipated ribbon cutting in October 2019. I would like to give a big THANK YOU to our construction crews for their countless hours of hard work, dedication, and time spent away from families. There are often over 80 workers on site helping to make this dream a reality. As work progresses, I have no doubt that the new Mountain Valley School is going to be a special place for our students, staff, and community. We are building for our future, and nobody deserves it more than our kids. One of my previous blog posts, The Pursuit of Happiness, explored long-term happiness and its greatest determining factor: quality relationships. Money, shiny new cars, and fame might bring happiness for a while; however, these feelings of satisfaction are brief and fleeting. It turns out that a fulfilling and happy life is much more likely to be found through the development and nurturing of close relationships with others. At first, this seems too simple, but if we dive a little deeper and study the evolution of happiness, it begins to make a little more sense. Let’s start out by rewinding history 70,000 years or so to the Cognitive Revolution. According to Yuval Noah Harari’s bestselling book Sapiens: A Brief History of Humankind, the Cognitive Revolution marked a time in history where humans quickly improved communication and social skills, leading to increased cooperation and more complex relationships. Back then, small groups of hunter-gatherers foraged for food, and trusting relationships were critical. Without the cooperation of tribal members, lone individuals would quickly fall prey to sabertooth tigers and the like. The combined efforts of the tribe were essential for survival, and tight-knit groups were the backbone of ancestral hunter-gatherer societies. Around 12,000 years ago, with the arrival of the Agricultural Revolution, hunter-gatherers began to settle into a sedentary agrarian existence. Farming allowed for larger and larger societies. With increased population growth, cities and towns began to dot the landscape. Consequently, the trusting social relationships that were known to our foraging ancestors were no longer necessary for survival. Anthropologist and evolutionary psychologist Robin Dunbar, best known for his postulation of Dunbar’s Number, suggests that stable social relationships can only be maintained with 150 people. As societies outgrew this number, people became more and more disconnected from each other. Close relationships within small groups were replaced by restrictive rules, laws, and enforced norms required to maintain stable agrarian societies. The Scientific Revolution began to gain traction around the middle of the sixteenth century. Great advances in knowledge, science, and mathematics led to increased efficiency. The Industrial Revolution quickly followed in the mid-eighteenth century. Hand production was quickly replaced by the manufacturing process, allowing for unprecedented population growth and further diminishing the focus on quality human relationships. Recently, the Technological Revolution has introduced new technology at a mind-boggling pace. The internet and smartphones are everywhere. Social media has allowed humans to “socialize” without ever having to take their eyes off of the screen. Many families go out to eat and don’t bother putting their phones away, continuously scrolling through appetizer, dinner, and dessert. We no longer have to forage in small trusting groups to survive. We simply click a button and receive instant gratification, as nurturing and caring relationships are replaced by cyberspace and technology. With all of the societal advances brought about through the various revolutions, are humans any happier than they were 70,000 years ago? The answer may be in the statistics. For the first time in human history, suicide rates have surpassed deaths by violence. Colorado has one of the highest suicide rates in the country, with suicide being the leading cause of death for 10 to 20-year-olds. This is an alarming statistic that I believe is inversely related to the decline of close and trusting relationships. Since the beginning of time, humans have been hard-wired to create and depend upon caring and nurturing relationships. Happiness has evolved (or devolved) alongside our need for close bonds of friendship and love. Our happiness depends on nurturing and maintaining quality relationships with family, friends, coworkers, and community. Give it a try. You may come to realize that our foraging ancestors, through quality relationships, were happier than many people are today. Mountain Valley School, nestled between the foothills of the San Juan and Sangre de Cristo mountain ranges, is located at the northern end of the San Luis Valley in Saguache, Colorado. The name Saguache is derived from a Ute word with several contested translations including “blue earth,” “blue water,” “green place,” and “sand dunes.” Regardless of the exact meaning, Saguache stands out as a beautiful place full of history and culture. As we look to the future and build our new school, Mountain Valley hopes to integrate some of Saguache’s history in the process. Recently, the Board of Education approved an insignia that captures both historical and geographical perspectives of the area. According to tribal history, the Utes are the oldest residents of Colorado, having inhabited and traveled through the Saguache area for thousands of years. The Mountain Valley School insignia, which was inspired by Ute artist Kree Lopez, portrays the silhouette of a Ute rider on horseback. The Utes were one of the first tribes in North America to acquire horses from the Spaniards in the early seventeenth century. Consequently, the horse quickly became an integral part of Ute culture and one of their most prized possessions and symbols of wealth. As the Utes developed into expert riders and big game hunters, they began to dominate the landscape, traveling across large portions of Colorado, New Mexico, and Utah. Ute warrior and youth in the Rocky Mountains. Photograph, July 1871, by E.O. Beaman on John Wesley Powell’s survey of the Rocky Mountains. The symbol also incorporates seven black feather tips representing the seven Ute bands (Caputa, Mouache, Yampa, Parianuche, Sabuagana, Tabeguache, and Weeminuche) that inhabited Colorado and traveled through the Saguache area. The path in the center foreground of the Mountain Valley design signifies the Ute trail system around Saguache, which later became known as the North Branch of the Old Spanish Trail. The North Branch of the Old Spanish Trail followed ancient Ute trails from Saguache, across Cochetopa Pass, and on through Gunnison. Geographically, the insignia depicts the San Juan Mountains in black and the Sangre de Cristo Mountains tipped in red with the San Luis Valley in the foreground. Mountain Valley School colors of cardinal red, black, and white are also included. In transitioning towards the future and a new school, we desire to create a respectful and welcoming environment at Mountain Valley. One that accurately represents the history and culture of our area, a badge of honor for our students, our school, and Saguache. During the cold and short days of winter, happiness can often be elusive. For many, the pursuit of happiness is frequently a journey without a destination. Like a ship blown off course, so too are people searching for happiness, often times through consumerism, materialism, and social media. Thousands of daily advertisements and Facebook posts lead us to compare ourselves with others and believe that we are inadequate. Consumerism tells us that we need to have the latest and greatest gadgets to be happy. When we buy something new, it can temporarily bring us joy, but the feelings of contentment quickly fade, leaving us unsatisfied and longing for more. Photoshopped celebrities with big smiling faces lead us to believe that our appearances just don’t measure up to Hollywood standards. Consequently, fashion, fitness, and skin care industries are booming as people strive for unattainable perfection. Likewise, our “friends” on social media always seem so happy, living lives full of excitement. Rarely are trials and tribulations captured in selfies and posted on social media. These media-driven expectations can quickly lead to feelings of unhappiness. So what is the secret to happiness? A brain scientist would probably say dopamine, oxytocin, serotonin, or endorphins. It is true. These brain chemicals can and do produce feelings of happiness, but that’s not much help when it comes to finding your happy place. Jay Harrington, author of The Single Most Important Factor in Leading a Happy, Fulfilling Life—According to Science, explains that long-term happiness comes down to a single factor: the quality of our relationships. True happiness does not come from money, fame, or good looks—it’s about the people we choose to surround ourselves with and how well we nurture our relationships with them. Plain and simple, quality relationships lead to happier and healthier lives. At Mountain Valley School, we strive to empower and prepare every student for lifelong academic success and personal growth. Quality relationships are the foundation of our work. Early on in my administrative career, the focus was on building positive relationships with all students, but something was missing. I realized that I had been neglecting other important areas, self-care and quality staff relationships. What are you doing to take care of each other? What are you doing to take care of kids? This focus on self-care and building quality relationships, not only with students but among staff, has led to a happier, healthier and more positive school culture at Mountain Valley. During my six years at Mountain Valley School, I have never felt more proud of the cohesive work we are doing as a staff. Thank you, Mountain Valley staff, for taking the time to nurture positive relationships with each other and with our students. You are making a difference in the pursuit of happiness! Athletic director Larry Joe Hunt asked me to give out a special award at the Mountain Valley/Moffat Fall Athletic Awards Banquet last week-the Field of Dreams Award. I was honored. This award has a special place in my heart and symbolizes overcoming obstacles, specifically the "You can't do that" obstacle that is often heard when new and innovative ideas are brought forward for the first time. As I thought about the meaning of the award, I was compelled to tell a story about the history of the Field of Dreams from my point of view. Here is that story, as told at the awards banquet. Before I give this special award tonight, I want to tell you a story about a dream that began two and a half years ago when I became the superintendent of Mountain Valley School District. I had a vision and a desire to create a better learning environment for our students, our staff, and our community. Instead of taking his advice, I talked to the Mountain Valley School Board, and they believed in the dream. I started visiting with the community, and they believed in the dream. I talked to the Colorado Department of Education Capital Construction Board. They believed in the dream and ranked Mountain Valley School as the number one new school construction project in the state of Colorado, awarding $27 million for a new school in Saguache. In order to receive the $27 million, our community had to approve a $3.7 million matching bond. When I started talking about the bond, once again I heard the familiar words, “You can’t do that. The Saguache community will never vote to increase taxes for a new school.” I did not take that advice either. Instead, I found about 30 people who believed in the dream and we started the Mission Possible campaign committee. Many of these people are in the room tonight. The committee worked hard and found more and more people who believed in the dream, and on November 7, 2017, Mountain Valley School District voters approved the $3.7 million bond to build a new school. As we were designing the new school, someone asked me, “What about football?” I answered, “What about football?” They said, “You can’t play football at Mountain Valley for two years. You won’t have a field to play on.” I quickly realized that I hadn’t thought that far ahead. I was told that we would have to cancel football at Mountain Valley or send our athletes to Center to play for the Vikings. These alternatives were not in the best interest of our students. I found out who owned the fields, Corey and Aubrey Hill, and in no time Corey Hill, Coach Johnson and I were out walking in the cow pastures, kicking rocks, stepping off distances, and imagining the 2018 football season. We were all hooked on the dream! We began working with the Colorado Cattlemen's Association. They believed in the dream and said we could play football on a conservation trust pasture. The dream was still alive. I remember watching with pride as our young men and women worked the pasture with rakes and shovels building their very own Field of Dreams. I watched Scott Alexander smooth out the high spots with his tractor. I watched our construction superintendent Troy Sergesketter shoot and mark the corners of the football field. I watched Anthony Salaz watering and preparing the field. I watched Larry Joe Hunt measuring and marking the lines. I even watched a last-minute goal post go up. I watched all of this with pride. Tonight, the Field of Dreams Award goes to a couple who made all of this possible. Without their generous support, the Field of Dreams would have been just that, a dream. Thank you, Corey and Aubrey Hill, for making the Field of Dreams a reality! An August filled with tragedy and heartache made for a rough start to the 2018-2019 school year. At a time when we needed a reason to cheer, a distraction from life’s trials and tribulations, the Mountain Valley/Moffat athletes did not disappoint. The Mountain Valley/Moffat high school volleyball team. Photo by Cassidy Cheyenne Photography. As spectators and fans, our community did not disappoint our athletes. Attendance during sporting events was the best I have ever seen. I was proud of the way everyone cheered for and supported our teams whether they were winning a big game or losing a tough one. It is with sincere appreciation and gratitude that I send a big THANK YOU to all of our amazing fans who supported the Mountain Valley/Moffat athletes during the fall sports season. The Mountain Valley/Moffat high school football team. Photo by Cassidy Cheyenne Photography. Many fond memories were made this season; however, a favorite memory for many of our fans was the sound of our school song echoing off of S Mountain at the end of a tough game. For it’s the score we’re waiting for! The Mountain Valley/Moffat middle school volleyball team. Photo by Cassidy Cheyenne Photography. The fall sports lineup for Mountain Valley included high school volleyball, high school football, middle school volleyball, and middle school football. Our neighboring school in Moffat hosted both middle school and high school cross country. The Moffat/Mountain Valley cross country team. Photo by Jessica Phillips Bella Photography. I want to thank all of our coaches and athletic directors for the extra hours logged for our athletes. Thank you, Beth Schroeder, Jessica Phillips, Joel Johnson, Justin Wilson, Elaine Flick, Kelsey Hammel, Larry Joe Hunt, Michael Roberts, Crystal Wade, and Dale Harrison. You make a huge difference in the lives of our students! The Mountain Valley/Moffat middle school football team. Photo by Cassidy Cheyenne Photography. During the fall sports season, so many people gave up valuable time in support of our athletes. Thank you to all of our referees, line judges, chain crews, bus drivers, and maintenance staff. Thank you to everyone who helped film games, run concessions, take gate, print programs, run clock, and supervise games. Thank you, parents, for supporting your children and being their greatest fans. Cross country headed to Regionals. Photo by Dale Harrison. In closing, I would like to thank our athletes for their dedication and commitment. It was fun watching everyone improve through hard work and determination during practices and games. It is not easy to balance school, life, and sports. Thank you, athletes. Thank you for giving us a reason to cheer! On a recent bus ride to Manzanola, Colorado with our high school volleyball and football teams, I started thinking about respect and how I hoped our athletes would represent themselves as visitors from Mountain Valley School. I was hoping they would earn respect, not only as athletes but as individuals. I was not disappointed as our teams worked together and exhibited unparalleled sportsmanship. Over the years, as an educator, I have seen people demand respect without ever trying to earn it. You can demand respect; however, true respect has to be earned. How else can you elicit feelings of deep admiration from others? As we make daily decisions with integrity, always working towards self-improvement and growth of our abilities, respect is slowly earned. Earning respect, like depositing money in a bank, can take years of hard work and dedication. Conversely, as demonstrated by many professional athletes, celebrities, and politicians, respect can be destroyed in a heartbeat through deceit, dishonesty, or corruption. Scholar and author C.S. Lewis reminds us that “integrity is doing the right thing, even when no one is watching.” If we follow these words of wisdom, we will never be in danger of losing hard-earned respect. As I reflect on this school year at Mountain Valley, respect comes to mind. I am proud of our staff who continually build positive relationships not only with students but with each other. I am proud of our students who overcome obstacles daily while treating others with dignity and compassion. I am proud of our families who dedicate so much time and energy to their children. And I am proud of our community for continually supporting Mountain Valley School. It is with pride and respect that I say thank you. Thank you for all that you do. Thank you for earning respect. At Mountain Valley, building positive relationships is a priority, and our entire staff has been working hard to create an amazing school culture. In fact, every staff member at Mountain Valley School is participating in a book study, which involves reading, discussing, and applying lessons learned through Culturize: Every Student. Every Day. Whatever It Takes by Jimmy Casas. Casas defines the word Culturize as follows: To cultivate a community of learners by behaving in a kind, caring, honest, and compassionate manner in order to challenge and inspire each member of the school community to become more than they ever thought possible. My day is always better when I get a chance to hang out with our students! Simply stated, if we want to improve student behavior and improve the culture of our school, we must first begin by changing the adult behavior. This means all adults-teachers, secretaries, administrators, bus drivers, custodians, food service employees-everyone. We all play a big part in building school culture. As adults, our attitudes are contagious. We can choose to be awfulizers and bring people down with negativity, or we can choose to be awesomizers and lift people up with positivity. I choose to be an awesomizer. As a school and community, we have the opportunity to become champions for all students, not just kids who are likable and helpful but struggling and resistant ones as well. In fact, these students need someone in their corner more than others. I firmly believe that it takes just one responsible and caring adult to make a difference in the life of a child. Will that person be you? Without a doubt, everyone can be a leader, and everyone can help shape the culture of a school, a town, or a community. Your interactions with others matter and people will remember how you treated them. Choose awesome over awful, and make a positive difference in someone’s life today. The Mountain Valley/Moffat volleyball team during pregame warmups against the Primero Bulldogs. Just recently, a new door opened for us, a door that will forever change our lives. On May 15th, 2018, our daughter Avery Ann Jenine was born. After months of anxiety, fear, anticipation, and excitement, Amy and I have a new baby girl and we are blessed beyond belief. I had worried that the door to my life as I knew it was closing; however, the moment Avery was born, it was love at first sight and that little girl stole my heart. It seems as though I spent a lot of time worrying about the closing door without even realizing how amazing it would be to step through the open door. We are headed toward the future of Mountain Valley School, and doors are opening and closing at a rapid rate. Abatement and demolition projects will begin in early June, starting with the cafeteria, woodshop, and bus barn. The Groundbreaking and Blessing Ceremony will take place on Wednesday, May 23rd at 2:00 pm. Mr. Hanley Frost from the Southern Ute Indian Tribe’s Culture and Education Department will be on campus to share Ute history of Saguache and bless our new school. FCI Constructors, Treanor HL Architects & Engineers, and NV5 will be on site as well. Everyone is invited to join us as the new Mountain Valley School construction doors open and we begin building the future! May is the busiest month of the year for educators, and this month is no exception. May 7-11th is Teacher Appreciation Week. Please take some time to thank a teacher for making a difference in the lives of children. We have a great staff at Mountain Valley School, and I want to give all of our teachers a big shout out and THANK YOU! I would like to personally congratulate the following staff members for their recent awards: Mountain Valley School Teacher of the Year: Andrew Virdin, Mountain Valley Employee of the Year: Patty Williams, I Love Kids Award: Peggy Williams, Above and Beyond Award: Renee Hazard, Continuous Creativity Award: Mimi Dolan, and Awesome Attitude Award: Eileen Wilfong. Congratulations and thank you for all of your hard work! The Mighty Minds Spring Concert and Art Show will be taking place on Thursday, May 10th at 6:00 pm in the Mountain Valley School gym. Mrs. Wilfong, Mrs. Hansen, and all of their classes have been working hard preparing for this event. Please join us for a fun-filled evening of music and art for the whole family. New School Update and Board of Education meetings will take place at MVS on Tuesday, May 15th at 5:00 pm and 6:00 pm, respectively. Bring your questions and get the latest updates on the progress of the new Mountain Valley School. The Class of 2018 graduation will be held on Saturday, May 19th at 10:00 am. Come on out to Mountain Valley School and help us welcome the Honor Class of 1968 and congratulate the 2018 graduates. Once again, the “future graduates” from preschool to 11th grade will kick off the graduation ceremony. I am excited and proud to announce that the Blessing and Groundbreaking Ceremony for the new Mountain Valley School will take place on Wednesday, May 23rd at 2:00 pm. The time is finally here and the Southern Ute Indian Tribe will be blessing our new school. Mr. Hanley Frost, Southern Ute Cultural Education Coordinator, will conduct the blessing ceremony, which will be followed by the Groundbreaking Ceremony. This is sure to be an event to remember, so mark your calendars and join us on May 23rd! Have a great week and enjoy this beautiful spring weather! Great things are happening at Mountain Valley School! As we look towards the future and preparing students for jobs that don’t even exist, it is critical that a variety of choices, experiences, and opportunities are provided. I am proud to announce that Mountain Valley School is working with Trinidad State Junior College to get an aquaponics program started for the 2018-2019 school year. Furthermore, our Colorado Shines quality rated preschool program just received their aquaponic fish tank and garden. It looks like our youngest students will begin delving into aquaponics at a very early age! The new preschool fish tank and aquaponic garden. In addition to aquaponics, shop classes will soon be offered at MVS, allowing students to work with their hands while exploring vocational careers. Life skills will continue to be offered at Mountain Valley School, along with art, music, physical education, and various internship opportunities. Our junior and senior students already enjoy visits to trade schools, junior colleges, and universities across the state. Last, but not least, I am excited about our new virtual job shadowing program, which allows students of all ages to explore various career opportunities around the world. Our Science, Technology, Engineering, and Mathematics (STEM) Night was a huge success thanks to the hard work and dedication of our high school science teacher Yvonne Morfitt and our school health professional Amy Norris. Over fifty community members enjoyed a free dinner and explored STEM while participating in the creation of elephant toothpaste and lip balm! Additionally, the oobleck tank, which was produced with over fifty pounds of corn starch, slime creation, and microscopic mitosis were big hits. A giant THANK YOU goes out to everyone who made Mountain Valley’s STEM Night a huge success! High school Science Club and physics students preparing Oobleck for the community STEM Night. Our Prevention Bingo Nights have also been a great success. So far, we have had two of these events and have had excellent attendance. I even had to add two extra tables at the last one! During prevention bingo, students, parents, and families learned all about the benefits of making positive choices when it comes to living a healthy lifestyle. Of course, it is always fun to yell “BINGO” and claim a great prize. Hopefully, we will have one more prevention bingo event before the end of the year. I would like to take a moment to appreciate Amy Norris, MVS staff, and the community for making Prevention Bingo Night so popular! It takes a village to raise a child, and we have a pretty awesome village! Thank you! Upcoming events include a New School Community Meeting to discuss the forward progress that has been made towards our new school. Things are really starting to come together as the design phase heads towards the construction phase. Our new school is going to be an amazing addition to our community that will benefit many generations of students! Be sure to attend the community meeting at Mountain Valley School on Tuesday, March 27th at 5:00 pm. Additionally, Mountain Valley School will be teaming up with Aventa Credit Union to present a Protecting Yourself From Identity Theft and Fraud Seminar. This great opportunity is free to the community and will take place at Mountain Valley School on Wednesday, March 28 at 5:30 pm. Adult education and lifelong learning help build strong communities. Remember, stay informed and protect your identity! As always, if you have any questions regarding Mountain Valley School, please contact me at garouttet@valley.k12.co.us or 719-655-0268. Have a great spring break week! “All change is hard at first, messy in the middle, and gorgeous at the end.” This quote by author Robin Sharma defines the struggle of change, a struggle that we all encounter at one time or another in our lives, a struggle that is real. During my life, I have faced unexpected change and adversity many times. In retrospect, I have a better understanding of my life’s challenges. Despite the struggle, they have all made me stronger or my life better in one way or another. I have found that change always has its purpose. As we move forward with the building of a new school in our community, change can be uncomfortable and downright hard for some people. Things will no longer be as they have been for over fifty years at Mountain Valley School. We will have a state-of-the-art building for our students, staff, families, and community; however, our campus layout will physically change. The new school will be built on the east end of our property and the athletic track and field will be on the west side. This arrangement will allow students to attend school in their current location while the new school is built, eliminating the need for displacement during construction. Architectural rendering of the new Mountain Valley School as seen from the intersection of Pitkin Avenue and Third Street. My goal as superintendent of Mountain Valley School District has always been transparency while doing what is best for kids and our community. Over the past year and a half, numerous community meetings have been held in various locations, all with the intent of disseminating and gathering information regarding the new school at Mountain Valley. A team of around 18 volunteer community members, known as the Design Advisory Group, has worked hard to design a site and school that will meet the needs of our students, families, and community for many years to come. Every decision has been made focusing on what is best for all stakeholders. In the end, we will not only have a new school to adequately prepare our kids for the future, we will have a welcoming community space for people of all ages. The latest floor plan of the new Mountain Valley School. Mountain Valley School District, through a competitive and transparent bidding process, has assembled the best possible team of professionals, including architects, engineers, surveyors, and contractors. I am confident that our team will build an amazing school for our students while addressing the needs of the community. Lately, the discomfort of change has led to a lot of misinformation in our community. If you have questions or concerns regarding Mountain Valley School, please don’t hesitate to visit with me personally. I will provide honest and accurate information. Remember, all change is hard at first, messy in the middle, and gorgeous at the end. I am sure that the struggle of change will produce beautiful results when our new school opens during the fall of 2019! Please feel free to download the architectural rendering and floor plan below. The Design Advisory Group (DAG) for the new Mountain Valley School met for the fourth and final time on Wednesday, January 24, 2018. The DAG, which was comprised of 16 community members, was responsible for helping to design the layout and site plan for the new school. I am so proud of all of the hard work that the DAG has put into designing a school that will be a perfect fit for our community. Watch the following video to see detailed slides from the DAG meeting #4. Additional site plan and school layout information will be available during a community meeting that will be held at Mountain Valley School on Wednesday, February 7th at 5:00 pm. Latest site plan for the Mountain Valley School campus. Updated first-floor layout. Updated second-floor layout. Architectural rendering of the new school from the parking lot entrance. Architectural rendering of the main entrance to the school. Architectural rendering of the cafeteria and gym exterior. Architectural rendering of the new school as viewed from Pitkin Avenue. These renderings and plans are the basic building blocks of the new school and will continue to evolve as the various user groups take over refining the design process. If you have any comments or questions regarding the latest campus layout and new school design, please feel free to contact any DAG member (Amber Johnson, Aubrey Hill, David Hammel, Kathy Hill, Lacy Reed, Lisa Jaminet, Bobbie Baughman, Marilyn Fenton, Mark Hammel, Mona Lovato, Paula Lujan, Peggy Williams, Yvonne Morfitt, Eric Frey, Chuck Tidd, and Travis Garoutte). Don’t forget to join us for the new school community meeting at Mountain Valley on Wednesday, February 7th at 5:00 pm. The word “passion” is thrown around a lot these days. I’m passionate about this. I’m passionate about that. What are your passions? Before you answer, let’s take a closer look at the true meaning of the word passion. Passion is a Middle English word, from Anglo-French, derived from Late Latin passion and passio, meaning suffering or being acted upon. Passion’s earliest origins begin with the Latin word pati, to suffer. So, let’s take it way back and use a little Latin. What are you passionate about, or for what are you willing to suffer? I immediately think of my family. I am willing to suffer for my family. Interestingly, the word “family” originates from the Latin word famulus, meaning servant. Now, when I use Latin and say I am passionate about my family, I might be saying that I am willing to suffer as a servant. Educators are servants. They are an extension of the family. In fact, the legal term in loco parentis (also Latin) is used in education and quite literally means “in place of a parent.” The school environment is filled with servants who are passionate about kids. When I say this, I mean all staff members, from maintenance to foodservice, transportation to administration, and of course, teachers. Passionate people make a difference in the lives of children. The short video Every Opportunity produced by Atlanta Speech School shows the importance of positive interactions, especially with students. Simple interactions make a difference, and we should take every opportunity to put our best foot forward and build meaningful relationships. Even when we are grumpy and having a bad day, it is important to let our passion show and serve the people who need us most, our children. When I ask about your passions, I hope they include answers related to personal growth, family, and community. If you are an educator, I hope your answers include children. With that said, what are you passionate about? Some things are worth suffering for; others are not. After a month of brainstorming and planning, the Design Advisory Group (DAG) is getting close to finalizing the site layout and floor plan for the future Mountain Valley PreK-12 School. There is only one more DAG meeting left, and everyone is getting excited to move from the design phase to the construction phase, which is expected to begin in late May or early June of 2018. Starting from the west side of the property, the site plan below shows a regulation 1600 meter track with a field inside. This area will be large enough to accommodate an 80-yard field for 6-man football or a 100-yard field for 8 and 11-man football. A regulation-sized soccer field will also fit inside of the track. The track and field will be utilized for various community activities and sporting events, as well as allow for future expansion of athletic programs at Mountain Valley School. The PreK-12 School is located just east of the track with educational and community use areas. The wing to the west will be utilized for both school and community activities and events. The two-story north wing will house most of the academic classroom spaces. This site layout allows for increased security on campus, protection from prevailing winds, and southern sun exposure on all approach sidewalks, parking lots, and playground areas. The preschool playground will be placed off of the preschool classroom, and the elementary playground will be southeast of the track. Transportation facilities and additional athletic event parking are shown on the west side of the property. Adequate parking, secure student drop off areas, and separate bus loading and unloading zones will increase safety on campus during the busy morning, lunch, and afternoon hours. School plazas and memorials will be located around the school. The community garden and geodesic dome greenhouse will remain on the south side of the property. The first floor of the school is shown with elementary, media center, team center, administration, art, and weight room areas throughout the north wing. The west wing houses the gym, auxiliary gym, locker rooms, concessions, cafeteria, home economics, vocational education, performing arts, and storage spaces. Community engagement and access are important at Mountain Valley School. Consequently, the media center and most spaces in the west wing will be available for various community activities and events. The second-floor layout has the high school and middle school areas separated by the media center. A science deck will look out over the beautiful views from Saguache. The two gymnasiums, performing arts spaces, and a hidden mechanical area will be at a two-story height as well. If you have any comments or questions regarding the campus layout and new school design, please feel free to contact any DAG member (Amber Johnson, Aubrey Hill, David Hammel, Kathy Hill, Lacy Reed, Lisa Jaminet, Bobbie Baughman, Marilyn Fenton, Mark Hammel, Mona Lovato, Paula Lujan, Peggy Williams, Yvonne Morfitt, Eric Frey, May Engquist, Chuck Tidd, and Travis Garoutte) or stop by Mountain Valley and visit with administration. For even more information on the DAG process, click on the links below to view the minutes and slides from all three of the previous meetings. The design process for the new PreK-12 school at Mountain Valley is underway! We have assembled a fantastic team and are quickly making progress towards realizing the hopes and dreams for the future of our school and community. Design Advisory Group member Bobbie Baughman shares her thoughts on school site use and placement. After a transparent and competitive interview and bidding process, Mountain Valley School District has hired NV5 as owner’s representatives, TreanorHL as the architectural and engineering firm, and FCI Constructors. This team is a great fit for our school and community, and I am excited to be working closely with them during the design and construction of our new school. Eric Frey discusses site design with the Design Advisory Group. Additionally, over 15 community members have volunteered to serve on the Design Advisory Group (DAG). The DAG met on December 6th for around three hours and discussed hopes, dreams, goals, visions, opportunities, and challenges around the new school design. It was a great first meeting full of enthusiasm and optimism as possible school placement and designs were discussed and modeled. The Design Advisory Group (DAG) process will be completed in four or five meetings. One of the responsibilities of DAG members is to solicit feedback from various stakeholders in the community and relay that information to the design team. If you would like to share your thoughts and ideas before our next community meeting, please contact one of the following DAG members: Amber Johnson, Aubrey Hill, Julia Hammel, Kathy Hill, Lacy Reed, Lisa Jaminet, Bobbie Baughman, Marilyn Fenton, Mark Hammel, Mona Lovato, Paula Lujan, Peggy Williams, Yvonne Morfitt, Eric Frey, May Engquist, Chuck Tidd, or Travis Garoutte. It is important that the new school design includes input from all stakeholders. In the end, we want a school that meets the needs of our students and community. The Design Advisory Group examines various school models and layouts. These are exciting times for our students, staff, and community. I encourage everyone to visit with DAG members, attend community meetings, and take an active role as we design and build a new school at Mountain Valley. Thanks to our supportive community, Mountain Valley School is well on its way towards realizing the district goals of relationships, innovation, and rejuvenation. Relationships with all stakeholders is critical, and district residents are trusting Mountain Valley to create innovative and engaging learning environments, as well as multi-use community and athletic spaces as we design and build a new school that will serve our students, families, and community for many generations to come. Throughout this process, transparency is key. My hope is that everyone has access to accurate information and ample opportunities to share thoughts and ideas during the design and building phases. Our first new school facility community meeting with owner’s representatives NV5 and architects TreanorHL was held on Wednesday, November 29th at 5:00 pm at Mountain Valley School. Over 40 residents were present and met the NV5 and TreanorHL teams that will be working closely with the Mountain Valley community during this process. Topics covered during this meeting included Transparency Diagram, Design Advisory Group Process, High-Level Timeline, Community Input Process, Design Philosophy – Designing within Context, and Open Dialogue regarding Community Vision, Hopes, Dreams, and Fears. On the construction side of the project, Mountain Valley received proposals from four construction companies: GE Johnson, GH Phipps, Haselden-Diesslin, and FCI. GE Johnson has completed 124 PreK-12 School projects, including BEST schools in the San Luis Valley for Center, Sangre de Cristo, and South Conejos. GH Phipps has built schools throughout Colorado, as well as projects at Adams State University, San Luis Valley Health, and the Rio Grande Hospital. Haselden-Diesslin has completed over 130 PreK-12 schools, including Moffat School, Salida High School, and Longfellow Elementary School in Salida. Over the past five years, FCI has built over 120 educational facilities, including Ignacio High School, Ignacio Middle School, and Sanford School. A six-member selection team worked hard to score the proposals from the aforementioned construction companies. This was no easy task, as the proposals ranged from 45 to 68 pages, and each construction company was highly qualified. Proposals were scored on the following criteria: Cover Letter; Firm Qualifications; Project Experience and References; High Performance/Sustainability Expertise; Team Structure, Experience, and Resumes; Cost Estimate; Project Schedule; and Project Approach. After the scoring was completed, the top-ranked construction companies were invited for face-to-face interviews at Mountain Valley School on Monday, December 4th. The interviews were scored and Mountain Valley is currently working to select a construction company to join our team and help build the new PreK-12 school in Saguache, Colorado. These are exciting times for our school and community! As we begin designing the new school, please attend the community meetings and share your input. Together, we can make a difference at Mountain Valley School. I am so proud of our community and its support of Mountain Valley in passing bond issue 3B for a new PreK-12 school in Saguache, Colorado. It is with great excitement that I look forward to the future of Mountain Valley School District and the positive impact this will have on our students, our community, and our future. As our journey continues, Mountain Valley is dedicated to working with all stakeholders to design and build a new school that will meet the needs of our students, families, and community. Together, we will make a difference in the lives of children. Thank you for supporting Mountain Valley School District and making this once-in-a-lifetime opportunity a reality. After visiting Saguache and Mountain Valley School last month, eleven architectural firms throughout Colorado and New Mexico submitted proposals. The proposals were assessed and scored by a six-member selection team, and the top four firms were invited for a face-to-face interview in Saguache on November 8, 2017. After a day of rigorous interviews, TreanorHL was selected as the architectural firm to design the new PreK-12 school at Mountain Valley. With over 50 years of experience in educational facility design, it is clear that TreanorHL is passionate about designing state-of-the-art active learning environments for PreK-12 schools. In addition to experience on the front range, TreanorHL has designed schools in the rural mountain towns of Lake City, Buena Vista, Leadville, Gunnison, Crested Butte, Carbondale, Basalt, Glenwood Springs, and Steamboat Springs. Chad Novak, TreanorHL Principal-in-Charge for the new PreK-12 Mountain Valley School project. Adam Braunstein, TreanorHL Project Manager for the new PreK-12 Mountain Valley School project. Scott Dangel, TreanorHL Project Architect for the new PreK-12 Mountain Valley School project. As we begin working with TreanorHL to design a new school that meets the needs of our community, a Design Advisory Group (DAG) will be formed. The DAG will consist of 10-15 members, including students, parents, community members, MVS staff and administration. The DAG members will attend DAG meetings, solicit feedback from all stakeholders, attend larger community input meetings, and help ensure that the new school is designed and built to meet the needs of our students, staff, and community. There will be a continuous cycle of DAG meetings and larger community input meetings to ensure that the new Mountain Valley School is a perfect fit for our community. If you are interested in the design process and serving on the DAG, please contact me at Mountain Valley School. I am looking forward to working with TreanorHL and the DAG to design our new school at Mountain Valley! Mountain Valley School District has been awarded a once-in-a-lifetime $27 million Building Excellent Schools Today (BEST) Grant to build a safe and secure 21st-century learning facility for our students, our community, and our future. To receive this BEST Grant, voters who reside in our school district must approve a matching $3.7 million bond. Voting ballots have been mailed and the official election deadline is Tuesday, November 7, 2017. Many residents have attended community meetings and received accurate information. However, some misinformation has recently surfaced and I would like to revisit the most frequently asked questions in detail. My hope is that all citizens will have factual information when they vote on ballot question 3B. Mountain Valley’s main building is over 50 years old and beyond its useful life. The current middle school was built in 1995 and will be repurposed as a transportation and maintenance facility. Building Excellent Schools Today legislation was passed in the spring of 2008 for the purpose of assisting school districts with low property values in upgrading facilities to a minimum standard of safety and functionality. Without this BEST funding, low property value school districts, like Mountain Valley School District, would never be able to build safe and modern school facilities for our students, families, and community. HOW MUCH WILL THE PROPOSED NEW SCHOOL COST? The total cost of a new PreK-12 school facility presented in the Mountain Valley School BEST Grant proposal was just under $31 million dollars. Last May, Mountain Valley School District was awarded a $27 million BEST Grant. To receive this BEST Grant, it will be necessary for district residents to match about 12% of this cost by approving a $3.7 million bond during the 2017 election. The State of Colorado will be providing 88% of the approved BEST project funding costs. Architectural drawing of possible new school layout. The final design will be determined by Mountain Valley students, staff, administration, and community. WHAT WOULD IT COST TO SIMPLY RENOVATE OUR CURRENT FACILITIES AT MOUNTAIN VALLEY SCHOOL DISTRICT? A 2009 facilities assessment by the Colorado Department of Education found almost $17 million worth of needed repairs at Mountain Valley School District. Since that time, conditions at the school have only deteriorated while costs have escalated. With a bonding capacity of only $3.7 million, Mountain Valley School can never repair the existing problems without funding assistance. Due to the current condition of our facilities and cost to renovate, remodeling was never a feasible option. The Colorado Department of Education’s Capital Construction Board ranked Mountain Valley’s new school construction project as the highest need in the state of Colorado and awarded a $27 million BEST Grant to build a new state-of-the-art school facility for our community. WHY DOES THE MOUNTAIN VALLEY SCHOOL COST MORE THAN THE MOFFAT SCHOOL? Moffat’s new school was completed in August 2015, four years ahead of Mountain Valley’s scheduled completion of August 2019. According to NV5, the owner’s representatives for Moffat during their project, school construction costs have escalated more than 10% per year for rural and mountain communities. That is at least a 40% increase in construction costs. The Moffat School’s final cost was close to $18.3 million for 47,000 square feet of space or $390 per square foot. When current construction cost escalations are factored in, projected costs for Moffat’s school would be much higher in today’s market. Mountain Valley’s $31 million project is 67,000 square feet and works out to $462 per square foot. The Mountain Valley School will have additional student and community spaces, which include a gym and auxiliary gym, weight room, stage, media center, community garden, football field, rubberized track and a fitness trail. The new facility at Mountain Valley will be more than a school for students; it will be a welcoming space for our community and families. WILL WE KEEP ANY OF THE BUILDINGS WE ALREADY HAVE? The Mountain Valley School District Facilities Action Plan allows the Middle School building to be repurposed as a Transportation and Maintenance facility. HOW DISRUPTIVE WILL THE CONSTRUCTION PROCESS BE TO THE EDUCATION PROCESS? The Mountain Valley School District Facilities Action Plan shows that the new school will be built and opened before vacating the old buildings. WHY IS IT SO IMPORTANT TO DO THIS NOW? ARE OUR CURRENT BUILDINGS NO LONGER SAFE? During the 2017 BEST Grant application process, Mountain Valley School District was the top-ranked school in the state needing new educational facilities. Our buildings currently exhibit numerous safety, electrical, plumbing, HVAC and roofing issues, as well as other urgent needs. In addition, there is only a limited amount of BEST funding available for projects like the one Mountain Valley School District has been awarded. This could be a once-in-a-lifetime funding opportunity to provide a much-needed new PreK-12 facility for our students, families, and community. With a bonding capacity of only $3.7 million, our district will never be able to improve our facilities situation and provide both today’s and tomorrow’s students with the safe and modern facilities they deserve. This $27 million BEST Grant funding opportunity may never be offered to Mountain Valley School again. Moffat, Creede, Sanford, South Conejos, Sargent, Alamosa, Monte Vista, Sangre De Cristo and Centennial schools have already built new and modern facilities with BEST funding. Freedle Auditorium, built in 1933, is in disrepair and well beyond its useful life. This building serves as the kitchen, cafeteria, office and storage spaces at Mountain Valley School. HOW MUCH WILL THE NEW SCHOOL COST ME AS A TAXPAYER IF I OWN A HOUSE OR RESIDENTIAL PROPERTY IN THE DISTRICT? If your property’s assessed value is $25,000, your tax impact will be about $2.34 per month or $28.02 per year. If your property’s assessed value is $50,000, your tax impact will be about $4.67 per month or $56.04 per year. If your property’s assessed value is $75,000, your tax impact will be about $7.00 per month or $84.06 per year. If your property’s assessed value is $100,000, your tax impact will be about $9.34 per month or $112.08 per year. If your property’s assessed value is $125,000, your tax impact will be about $11.68 per month or $140.10 per year. If your property’s assessed value is $150,000, your tax impact will be about $14.01per month or $168.12 per year. If your property’s assessed value is $175,000, your tax impact will be about $16.35 per month or $196.14 per year. If your property’s assessed value is $200,000, your tax impact will be about $18.68 per month or $224.16 per year. If your property’s assessed value is $225,000, your tax impact will be about $21.02 per month or $252.18 per year. If your property’s assessed value is $250,000, your tax impact will be about $23.35 per month or $280.20 per year. HOW MUCH WILL THE NEW SCHOOL COST ME AS A TAXPAYER IF I OWN COMMERCIAL OR AGRICULTURE PROPERTY IN THE DISTRICT? For business and agricultural owners, the tax impact for every $100,000 of assessed commercial or agricultural property will be about $37.36 per month or $448.32 per year. WHAT HAPPENS IF VOTERS DO NOT APPROVE THE 2017 BOND DURING THE NOVEMBER 7, 2017 ELECTION? If the November 2017 bond fails, the $27 million BEST Grant awarded to Mountain Valley School District reverts back to the State of Colorado to be distributed to another school district that is willing to meet its BEST Grant match requirement. The first district in line to receive this money if we fail to pass our 2017 Bond is Mancos School District, which has already been selected by the BEST Grant Board as an alternate project should any project ahead of them fail to provide their match this November. If the bond fails, Mountain Valley School District will not have the necessary funding to address current safety issues and failing systems. BEST Grant funding is dwindling, and there is no guarantee that state funding will ever be available again to help our school. If you still need more information regarding the new school at Mountain Valley, please stop by the school and visit with me. Factual information can also be found at BEST for MVS and The Superintendent’s Corner websites. Thank you for taking the time to become an informed voter! As we plan and prepare for a new PreK-12 school at Mountain Valley, it is important to preserve and retain the rich history and culture from previous generations. This point has been articulated during the dozens of BEST Grant community meetings that have been held since November 2016. Hundreds of community members have participated and given input into what is important in a new school at Mountain Valley. Thank you to everyone who has participated in these meetings and helped build the vision and future of Mountain Valley School. Last week, Mountain Valley issued a Request for Qualifications for an architectural/engineering team to design our new school. The response was incredible with over fifty professionals showing up to visit our school, tour the campus, and learn what is important to our community as we move forward in the design process. Architects interested in submitting a proposal must consider the following key points that were discussed at length during the tour. How can we preserve the three memorials at Mountain Valley School? The Charles L. Coleman Jr. memorial was erected in 1996 on the north end of the football field in memory of “Corky.” This memorial includes two flagpoles set in a moss rock structure where Old Glory and the Colorado flag fly during home football games. 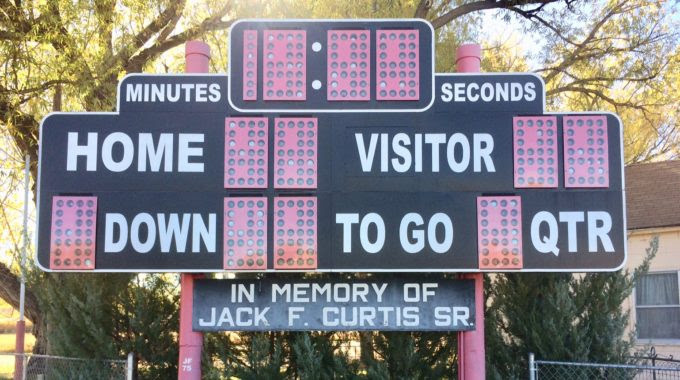 The Jack F. Curtis Sr. Memorial scoreboard has been a part of Mountain Valley football tradition for decades. This historic scoreboard memorial stands proudly at the south end of Jack F. Curtis Field. These historic memorials will be included in the design of the new school and campus. Possibilities include displaying all three memorials at the new Jack Curtis Field. Alternatively, a Memorial Park could be built at the end of 4th street welcoming visitors to our school. This Memorial Park could include a walking path that connects the three memorials and tells a history of Mountain Valley School. How can we transfer the artwork from the current gym to the new Bennett Gymnasium? The 1987 artwork designed and painted by Vincent Gallegos, Charles Graves, Lori Ortega and Edna Quintana honors our school and other schools in the San Luis Valley. When opponents walk into our gym, they are welcomed and inspired by various mascots from our region. Ideally, this artwork will be replicated in the new Bennett Gymnasium, representing the various school cultures from across the valley. How can we save and display the 10’ X 40’ Cochetopa Pass Buffalos mural that is painted on the south wall of the cafeteria? In 1988, Fred F. Haberlein dedicated the Cochetopa Pass Buffalos mural to the students and teachers at Mountain Valley School. Haberlein has been nominated twice for the Colorado Governor’s Award for Excellence in the Arts. Additionally, he has completed more single-handed murals than any other artist in the United States. Architects are already working on plans to save the Haberlein mural and display it in the new school. How can we ensure that the new school fits in with historic downtown Saguache? During the tour, architects were asked to visit downtown Saguache and consider historic architecture when designing the new school. School district residents have indicated that they do not want a school that looks like a “prison” or an “eyesore.” The new school should embrace the historic culture of the region while providing 21st-century learning spaces for our students. The architect/engineering firm will be selected on November 8, 2017, through a competitive proposal, scoring, and interview process. After an architect is selected for our new school project, a Design Advisory Group (DAG) will be formed. The DAG will consist of 10-15 members, including students, parents, community members, MVS staff and administration. The DAG members will solicit feedback from all stakeholders and help ensure that the new school is designed and built to meet the needs of our students, staff, and community. If you are interested in the design process and serving on the DAG, please contact me at Mountain Valley School. At Mountain Valley School, our mission for the past four years has been to empower and prepare every student for lifelong academic success and personal growth. As I have grown and matured as an educator, I have realized that education in a small rural community has a bigger meaning, a larger and broader scope. Students need to be empowered and prepared, but what about our staff, families, and community? How can we empower and prepare everyone? We all know that it truly takes a village to raise a child. Relationships. Our number one goal at Mountain Valley School is building positive and caring relationships, not only with students, but with each other as a staff, with parents and families, and with the greater Saguache community. Quality relationships drive the culture of a school. School culture can be felt the minute you walk through the front doors and can make or break an organization. We are continually striving for a welcoming environment where everyone feels safe, valued, and appreciated. Innovation. Innovation is all about doing something new and better. At Mountain Valley, we want to avoid embracing the status quo and doing things the way they have always been done. The world of education is changing too fast to cling to the past. Students and staff are encouraged to take risks and step outside of their comfort zones while personalizing their learning. My hope is that Mountain Valley will become a learning center for our community. Can you imagine an environment where a school is as much about adult learning as it is about student learning, a gathering place for a community of lifelong learners? Rejuvenation. After years of deferred maintenance, Mountain Valley School is focusing on rejuvenating outdated systems and facilities. Updated mesh WIFI at our school now allows students and staff the connectivity required to be successful in the 21st century. New Chromebooks have also been purchased for students and faculty. The resulting engagement, creativity, and critical thinking can be seen on a daily basis as personalized learning takes place in classes and during capstone projects. Our aging transportation fleet has been updated with a recently purchased route bus and two new activity vehicles. When our students are on the road, it is comforting to know that they are traveling in safe and reliable vehicles. Finally, Mountain Valley School has been awarded a $27 million Building Excellent Schools Today (BEST) Grant to build a new PreK-12 school for our students, staff, and community. If school district voters approve the required $3.7 million matching bond this November, we will have a safe, secure, and state-of-the-art learning facility at Mountain Valley. Mountain Valley School is dedicated to achieving our relationship, innovation, and rejuvenation goals. We have made great progress in a short amount of time, and we are well on our way to empowering and preparing our community of lifelong learners! Please share your thoughts on how Mountain Valley School can empower and prepare all stakeholders as we travel together on the path of continuous personal growth and improvement. Mountain Valley School District was recently awarded a $27 million BEST Grant to build a new PreK-12 school. There have been a lot of great questions during this process, and I want to take some time to answer these frequently asked questions. My hope is that our residents will have all of the information they need to make the best decision possible for our students, families, and community. Building Excellent Schools Today legislation was passed in the spring of 2007 for the purpose of assisting school districts with low property values in upgrading facilities to a minimum standard of safety and functionality. Without this BEST funding, low property value school districts, like Mountain Valley School District, would never be able to build safe and modern school facilities for our students, families, and community. The total cost of a new PreK-12 school facility presented in the Mountain Valley School BEST Grant proposal was just under $31 million dollars. Last May, Mountain Valley School District was awarded a $27 million BEST Grant. To receive this BEST Grant, it will be necessary for district residents to “match” about $3.7 million of this cost (about 12%) by approving a bond during the 2017 election. The State of Colorado will be providing 88% of the approved BEST project funding costs. Outdated plumbing and frequent sewer backups cause school cancellations. WHAT HAPPENS IF VOTERS DO NOT APPROVE THE 2017 BOND DURING THE NOVEMBER 7, 2017ELECTION? If you still have questions or need more information regarding the BEST Grant, please contact me at 719-655-0268. I would be happy to schedule a time to meet and tour our school. It is going to be another great year at Mountain Valley School, and I am excited to see students back in the building. I have truly missed all of the kids and the laughter and joy they bring. As we begin the 2017-2018 school year, MVS will be focusing on three main goals: relationships, innovation, and rejuvenation. I believe that relationships drive the culture of a school. Not just relationships with students, but relationships with parents, families and the community. It is also critical to foster quality relationships between staff members as we work towards continuous improvement. This year, we will continue to build positive relationships with each and every student, family and the greater community. My hope is that everyone can feel the welcoming atmosphere at Mountain Valley the minute you walk through our doors. Transportation, technology, and facilities are all focuses of rejuvenation this year. Our aging transportation fleet was in desperate need of attention, with most vehicles logging close to 200,000 or more miles. In order to provide safe transportation for our students and staff, Mountain Valley School recently purchased a route bus as well as two activity vehicles. Technology improvements at MVS include quality mesh WIFI throughout the entire school, which has completely solved our past connectivity problems. Additionally, teachers and students now have up-to-date Chromebooks and will be integrating technology throughout the curriculum. Drawing of possible new school, which includes the following community spaces: Community Garden, Fitness Trail, Rubberized Walking Track, Stage, Media Center, Main and Auxillary Gyms, and Meeting Spaces. We will be having BEST Grant and 2017 bond election community informational meetings regularly to help inform and educate school district citizens regarding facilities issues and concerns, the $27 million BEST Grant that Mountain Valley School has been awarded, and the $3.7 million matching bond that is required to build a new school. During these meetings, we will celebrate our success in obtaining the BEST Grant, review the proposed plan for the new school, discuss the 2017 bond election, answer questions, and seek community input. EVERYONE is invited! We welcome and need everyone’s input! I hope to see you at our BEST Grant and 2017 bond election community meetings!